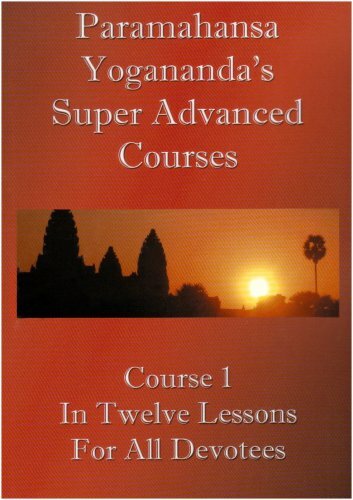 These are the Swami's complete courses In Self-Realization The Spiritual Teachings of Paramhansa Yogananda I.Christian yoga and the hidden truths in St. John's revelation interpreted according to intuitional experience II.Developing response-bringing mental whispers: the easiest and surest method of rousing the spirit in answer to your demands. III.Reversing the searchlights of the senses. Where is your consciousness centered? In what slums is your soul roaming? IV.Art of finding true friends of past incarnations what is friendship? V.The divine magnetic diet: physical and mental methods for rejuvenating the body cells and awakening the latent powers of the mind and the inner forces of the soul VI.Installing habits of success, health, and wisdom in the mind at will VII.Magnetism. VIII.Obliterating the malignant seeds of failure and ill health from the subconscious mind IX.Unique concrete psychological machines or inner devices for conquering fear, anger, greed, temptation, failure consciousness and inferiority complexes X.The art of super-relaxation XI.Converting the hands into healing batteries of life force: healing like Jesus by the laying on of hands healing stricken people from a distance XII.Esthetic way of developing cosmic consciousness. Yogananda emphasized the underlying unity of the world's great religions, and taught universally applicable methods for attaining direct personal experience of God. To serious students of his teachings he introduced the soul-awakening techniques of Kriya Yoga, a sacred spiritual science originating millenniums ago in India, which had been lost in the Dark Ages and revived in modern times by his lineage of enlightened masters. Among those whobecame his students were many prominent figures in science, business, and the arts, including horticulturist Luther Burbank, operatic soprano Amelita Galli-Curci, George Eastman (inventor of the Kodak camera), poet Edwin Markham, and symphony conductor Leopold Stokowski. In 1927, he was officially received at the White House by President Calvin Coolidge, who had become interested in the newspaper reports of his activities. In the hundred years since the birth of Paramahansa Yogananda, this world teacher has come to be recognized as one of the greatest emissaries to the West of India's ancient wisdom. His life and teachings continue to be a source of light and inspiration to people of all races, cultures and creeds.